Lawyers have higher rates of depression, anxiety and stress. Are there really as many unhappy attorneys as we are led to believe? A new study was released this month with the largest sample size of employed attorneys ever studied. The findings showed a significantly different trend than past studies. In the past, the longer attorneys were in the field, the more they tended to have problems with alcohol, depression, anxiety and stress. This recent study of 12,825 employed attorneys found a complete reversal of that pattern. Lawyers with the highest rates of alcohol abuse were younger associates working in private law firms. Men had significantly higher rates of alcohol problems and depression than women while women associates had higher rates of anxiety and stress. All behavioral health problems were significantly higher for lawyers with 10 or less years of experience. The field of law at all ages and career stages showed higher rates of mental health issues than any other profession (20% for lawyers while only 11% for other educated working professionals). Lawyers were asked how many had sought treatment for these issues and about 7% of them had been in treatment. When asked about the biggest barriers to seeking treatment, 50% of attorneys cited concerns about privacy, confidentiality and not wanting anyone to find out about their issues. What is happening to young associates in the field, especially in private firms? This study was a large sample survey that did not explore the dynamics of these issues. 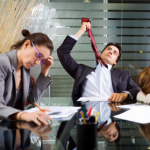 Psychologists have noted the long hours and competitive environments as associates try to win the “partner lottery.” The pressure to hit a billable hour requirement means that there is not time to be mentored, to recharge or even to spend time with their families. The partners who supervise and mentor associates have had no management training and many of them generally rely on criticism and negative feedback to be sure there are no errors in the work. Attorneys live in a high pressure/low control environment where they must meet demands but rarely have any latitude in how they meet those demands. Many of their interactions with colleagues are negative and adversarial as they compete in win-lose outcomes. This fits the descriptions given to me by my clients who are unhappy in this vocation. Of course, not all attorneys are unhappy. As they advance in their careers and partnerships, attorneys show a decrease in behavioral health problems. Attorneys who work as corporate counsel, the judiciary, teach in law schools and work in administrative roles are significantly happier than those in solo, private firm or public practice settings. Those whose personality traits fit the profession and who enjoy being analytic, impersonal and competitive are a better match for the field. Many young attorneys come out of school with unrealistic expectations and no real knowledge of what it is like to work as an attorney. Other professionals have the same dilemma. Years of training and investments of time and money to become a professional are required upfront before you can know what it is like to practice a profession. If you are concerned about the impact of your profession on your life and would like a consultation, please feel free to contact me.